I wonder if he’s had some bio-mechanic analysis on his kicking technique. It should be possible for a pro to improve. its funny with the kicking, sometimes you can’t ever get it sorted. I remember playing with a guy when I was a teenager. he was an amazing keeper, would make saves you thought were impossible. But when he had the ball in his hands to kick it out you had no idea where it was going to go. it was hilarious. This sums me up perfectly! When I first started playing there was no back pass rule. I think I was 12 when it came in and on the rare occasion a defender would play a highly discouraged pass back my sole instruction was “put your foot through it”. This was even the case at rep level all the way up to playing for NNSW. Playing out from the back was reserved solely to playing a short goal kick or throw to RB/LB. It’s poor coaching to expect a GK who didn’t grow up playing a game where they learned and developed a ball playing game to suddenly be a Mat Ryan, Alisson or Ederson. Yes they can develop better ball skills but under pressure they will always be suspect, Petr Cech & Liam Reddy are great examples from this season. There’s no excuse for Paul Izzo’s terrible distribution though. 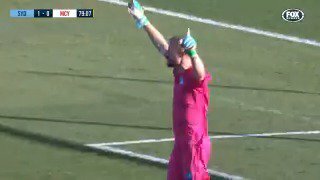 Even Sydney FC goalkeeper Andrew Redmayne is a little baffled as to why he's been able to save four of the last five penalties he's stared down. "I know when I first came (to Sydney FC), I shouldn’t say this but I was rubbish. I was trying to fit back into the mould that Crawley was trying to shape me into. I was a long way behind. Anyone up for singing “Redmayne” to the tune of Dolly Parton’s “Jolene“? Andrew Redmayne is gonna make that save. Redmayne kicked the ball directly out of play at least 3 times on Sunday. 2 were from goal kicks and the other was when he was under no pressure at all with the ball at his feet. He had a great game overall but how is it possible to be that bad in terms of distribution? If I remember correctly, the commentators were saying in the game against Adelaide that this was Redders 50th match for us, and he has 30 clean sheets. I don’t know about keeping stats but that sounds pretty damn good. He has 50 League matches for us, with 20 clean sheets in those games. He has 15 other games, with 5 clean sheets from those. It says a lot about how good our club is behind the scenes and the coaching we have, that he’s now comfortably in the top 2-3 keepers in the HAL. He’s come along way at the club, I think Lawrence Thomas is the only keeper who has been consistently a better than Bluemayne over the last twelve months. Why did Crawley not leave with Arnie? Probably enjoys actually doing his job. The couple of days every few months that you see 3 goalkeepers who don’t have time to be coached on anything and have their own coaches in europe would make you feel pretty redundant. Given how instrumental he was in establishing their careers I would say he is still in regular contact with both Maty Ryan and Danny Vukovic. I’m sure Arnie would listen to him if he got in contact to point out issues at a NT level as well. He could just manage it via email. You simply have to be these days.